Trivial Pursuit is at the bottom -- way, way, down at the end -- of my game list. I'd much prefer a rousing game of Cribbage, Sequence, or Rummy-Cube. My dislike for this classic American favorite stems from the inevitable moment when the reader of your question sighs, rolls his eyes, and exclaims how unfair it is that you get all the easy questions. At which point he reads a question for which you have no earthly idea what the answer might be. I suppose a twinge of public humiliation is good for controlling one's ego, but it sure ain't fun. Question: What happens when the yarn-overs in a lace pattern are not immediately next to their paired decrease? As fate would have it, I was just thinking about undulating, rippling lace fabric while stewing over Veronik Avery's Woolen Gloves pattern. 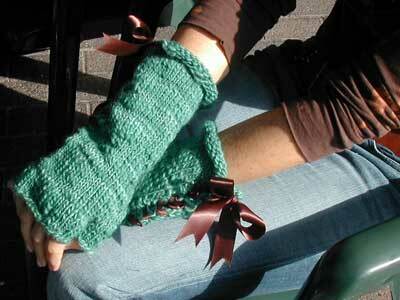 I love these gloves, but want to modify the pattern so I can knit the gloves from the top down -- fingers to cuff. The long lace cuff, however, features just such an undulating lace fabric and I'm afraid knitting it in the opposite direction would ruin the effect. What's a girl to do? I-cord fingers on one hand -- pun intended -- and proper looking lace on the other. Since my Grafting Epiphany eliminated all fears of grafting, I'm planning to work the gloves in both directions and graft the halves together at the wrist. Who knows if my approach will work, but the attempt will certainly be more fun then a snoring game of Trivial Pursuit. Working up from the cuff and down from the fingers. Here's to meeting in the middle! It was love at first sight. The perfect mix of color, lace, fingers, and thumbs -- practical and versatile, yet fun loving. 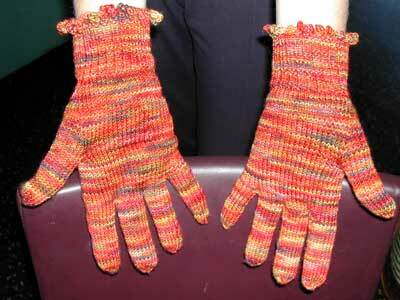 Have you seen Veronik Avery's Woolen Gloves and Latvian Fingerless Mitts from her new book, Knitting Classic Style? This dynamic duo has been designed to be worn separately or in combination -- mitts over, gloves under. 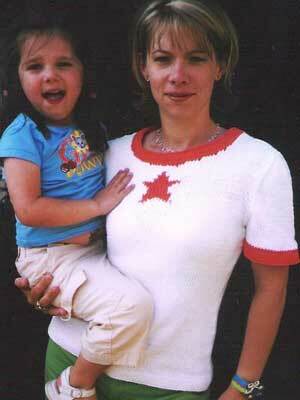 Come on, my friends, this is too cool to be resisted. I've ordered the yarn, knit the gauge swatch, and am poised to cast on. 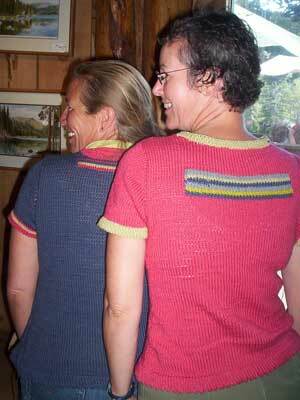 For those on Ravelry, I'm using these projects as my first foray into the mix -- check them out here. I've found through experience that I'm one of those knitter's whose gauge differs when knitting in the round verses knitting back and forth. 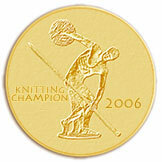 It's most certainly related to my tendency to row-out and to purl purls slightly bigger than I knit knits. 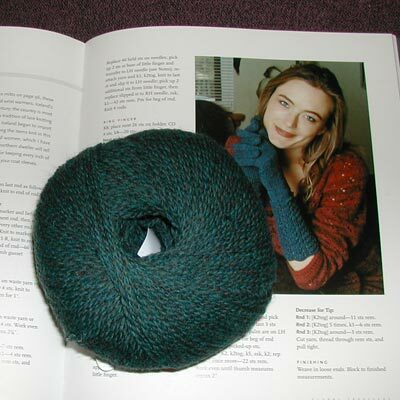 One advantage of my self awareness is that I now know to knit my gauge swatch in the round for in-the-round projects. 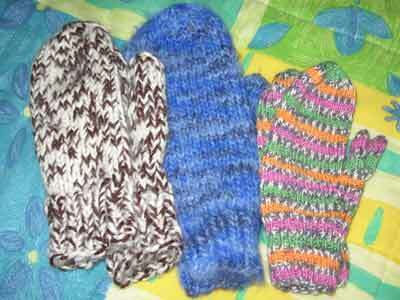 The gloves and mitts each call for a slightly different gauge even though they use the same yarn. In an attempt to front load my swatching, I knit this swatch for both project using three different needle sizes -- US2, US1, and US3. 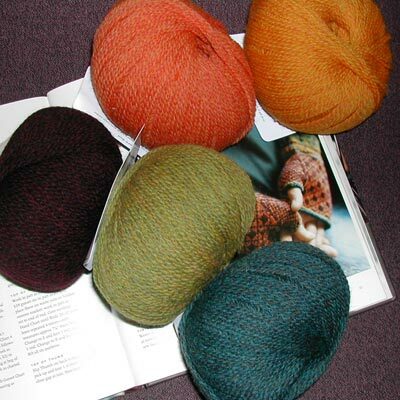 Swatching in the round on US2, then US1, then US3. nona-sister-the-eldest called me last Saturday. The nona-sisters are not big in the way of phone talking -- so if a nona-sister calls, you know something is up. "So", nona-sister began after the prerequisite how-are-yous were exchanged, "I've got 5 i-cord fingers, what the heck do I do next?" "How should I know", I replied, "You're 4 fingers ahead of me". In response to nona-sister's appeal, I read her an abbreviated version of Meg's pattern -- nona-sister is mega-crafty, she'll figure it out! It's now time for nona to figure it out and to share it -- piece by piece -- with you. I'm knitting my second pair of gloves using the i-cord finger technique and a spare skein of Koigu from my stash. Tonight I sat down and calculated the number of stitches I'll need for each i-cord figure tube. Care to take a peek? Ann Budd's "The Knitter's Handy Book of Patterns" is a wonderful reference for creating your own patterns. I'm using this book to determine standard glove sizing and as a litmus test for my calculated numbers. 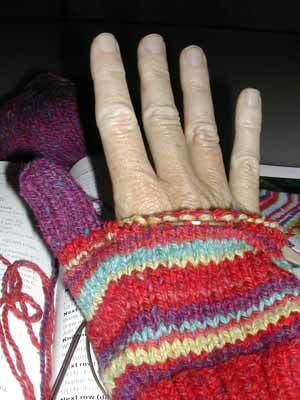 Pam Allen's "Progressive Gloves" article from Interweave Knits Winter 2003. This excellent article describes the basic anatomy of a glove and provides step by step directions for creating a glove pattern knit from the cuff to the fingers. 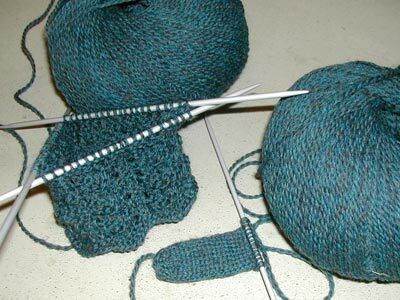 Meg Swansen's "Handknitting with Meg Swansen" describes how to knit a glove from the fingers to the cuff using i-cord fingers. She also provides an example pattern for a gauge of 5 sts to the inch. My calculating tools: a calculator -- math majors cannot add, a mechanical pencil -- never pen, and a notebook -- graph paper of course. My Koigu swatch knit in the round. My gauge is 7 sts to the inch. 2 circular needles, 'cause nona's ditched her double pointed needles. 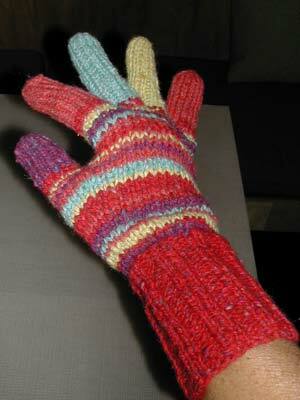 For those interested in knitting along, I'll be providing a serial pattern for these gloves. 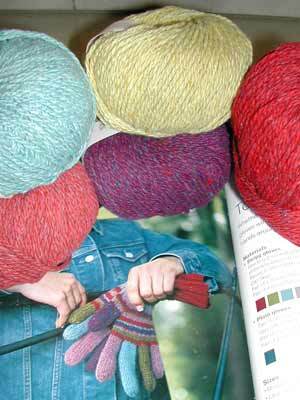 Check your stash for a comparable yarn and stay tuned for the next installment. And a bit of glove trivia. Do you know what a "fourchette" is? What makes you happy? For some its an exotic vacation or a gourmet dinner out. For others it's a child's smile or a beautiful sunrise. Perhaps it's a lollipop? A new pair of shoes? A good laugh? Money? Love? How about for nona? Let me tell you, inquisitive reader, what makes nona happy is that feeling of ah-ha when I discover something new. Today nona was happy. Today nona tried her first i-cord glove finger. I heard about i-cord fingers from Margene, I read about i-cord fingers in "Handknitting with Meg Swansen", and I tried an i-cord finger -- a pinky to be exact -- this afternoon. Such a simple, elegant solution to glove fingers! Shall I show you? Will is make you happy too? 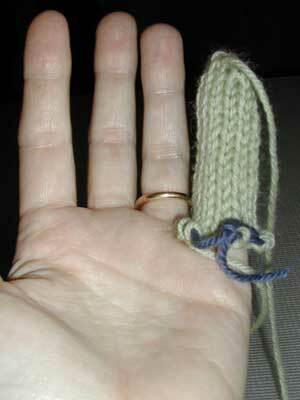 When using the i-cord finger technique, you knit your gloves from the tips of the fingers down to the cuff. 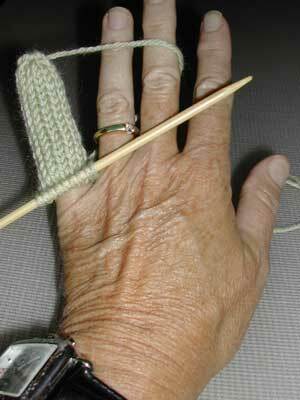 Each finger is knit individually and then joined to the body of the glove. 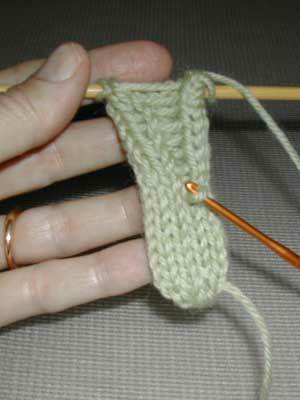 Continue working i-cord on 9 stitches for about 18 rows or until the tube is the length of your pinky. Because there are so many stitches the i-cord tube will not close. If you inspect the back of your tube, you'll see a ladder of horizontal bars. Have no fear, this is correct and you'll see why shortly. 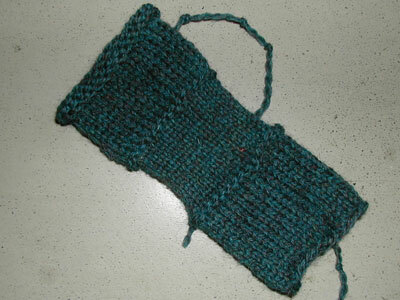 Before you begin, put the 9 pinky stitches on a piece of scrap yarn -- I know my picture doesn't show that, my bad. Continue working your way up the ladder until you get to the top. This new loop becomes the 10th stitch, joining the other 9 on the piece of scrap yarn. My i-cord pinky is good to go! If you're interested in trying this technique I highly recommend Meg Swansen's book, Handknitting with Meg Swansen, which contains an excellently written and illustrated pattern for knitting gloves using i-cord fingers. 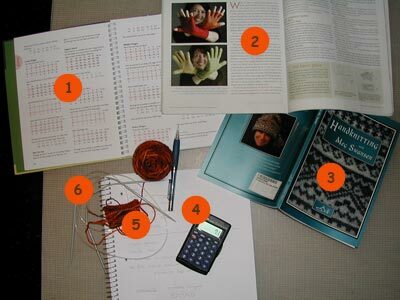 Over the weekend, with much enthusiasm and anticipation, I pulled out my pattern and yarn poised to knit my first glove. Thoughts of 2 circular needles knitting tiny finger tubes were dancing in my head. So, compassionate reader, you can imagine my disappointment when the phrase -- "join into a round, being careful not to twist" -- was no where to be seen. Hello? 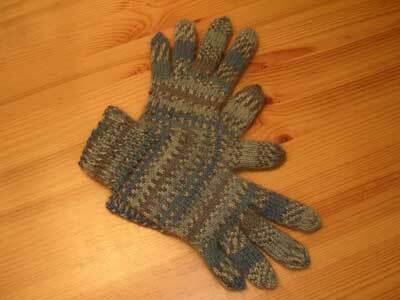 Don't tell me these gloves are not knit in the round? 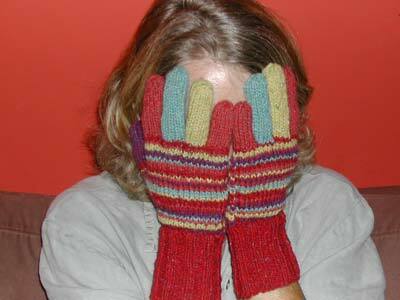 But alas it's true, the gloves are knit flat with lots of seaming -- nona was disappointed. But wait a minute! This doesn't sound like the nona I know -- so meek and sheep-like. Since when do I follow a pattern? 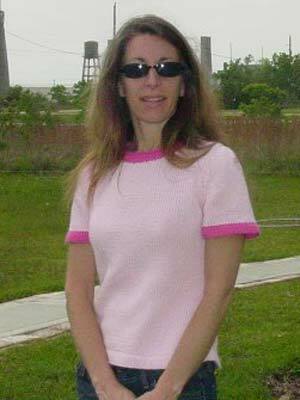 Since when do I shy away from knitting experiments? Since when do I dwell on the negative side of things? Pull yourself together girl and regroup. And regroup I did. My first glove project -- did you notice that I used the word "first" -- is going to be a glove experiment. 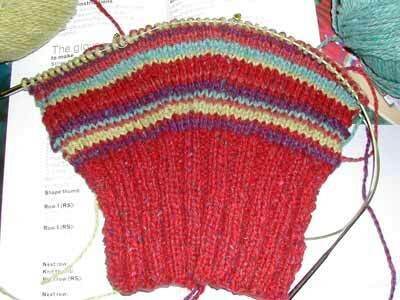 I'll knit the first glove following the pattern like a good girl and then will knit the second glove in the round. Let's just see which way works best. Is there life after socks? What, am I crazy? Of course there's no life after socks! What I'm really trying to say is -- what about the hands? Don't the hands deserve something hand knit? They're the ones doing all the hard work while the feet just hang around. Gloves, let's knit gloves. 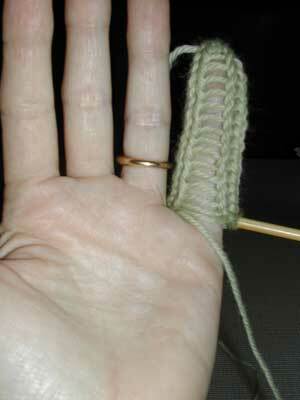 Besides, I'm really curious to try knitting the fingers with 2 circular needles. 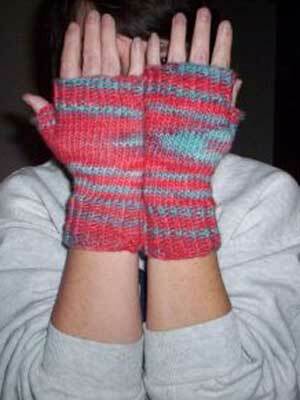 Anyone want to join me and knit a pair of gloves -- fingerless gloves count, you know. If there's enough interest, perhaps a knit-along is in order?